By Kizito Sikuka in Nairobi, Kenya. The Director for Trade and Industry at the African Union (AU) Commission, Treasure Maphanga said the integrated trade market known as the “African Continental Free Trade Area” (AfCFTA) will be operationalized in July, setting the stage to start implementing measures to promote the unhindered movement of goods and services across the continent. Maphanga said since the historic decision to sign an agreement to establish the AfCFTA in March 2018, a total of 52 African countries have signed the agreement, while 20 have ratified the agreement in their national assemblies. Of these, 15 have already deposited instruments of ratification with the AU Commission. “We are therefore on course for the AfCFTA to become operational by July this year and we are actively planning for this eventuality, expecting the largest free trade area of the world to be launched during the Extra-Ordinary AU summit in Niamey, Niger in July,” Maphanga told the delegates at a Trade Law Centre (Tralac) conference underway in Nairobi, Kenya. The process of approval of a continental legal instrument requires, first, signing, and then ratification, a process that differs from country to country. A protocol “enters into force” following ratification by at least 22 AU Member States. This advances the continental law from being a stated intention to actual application. Those member states that join after a protocol has entered into force are said to “accede” to the protocol. To support and ensure the successful realisation of the continental free trade area, plans are now at an advanced stage to establish a Secretariat that will monitor and track implementation. “The process has started for the establishment of the AfCFTA Secretariat, and an official report on progress will be submitted to the next meetings of the AU Policy Organs,” said Maphanga. Once the free trade area becomes operational, the next stage is to launch a continental Common Market. A Common Market is a higher level of integration where countries remove all trade barriers between themselves, establishing common tariff and non-tariff barriers for importers, and also allowing for the free movement of labour, capital and services between themselves. “So the work does not stop. Even as we implement the AfCFTA, successive rounds of negotiation will continue, deepening the integration in Africa” she said stressing that cooperation between sovereigns is crucial to ensure the free trade area’s success. In this regard, the continent should remain united and guard against external forces that do not want the AfCFTA to be a success. “As we enthusiastically build our single market, we also have to be aware of the challenges and dangers to implementation and to the realization of “The Africa We Want”. The current interest from our traditional and new trading partners needs to be carefully assessed and strategically acted upon in such a way that the ideals of the single market are not undermined,” she said. In light of these challenges, the AU Assembly that met in July 2018 actually made a decision that binds all African countries wishing to enter into partnerships with third parties to furnish the Assembly with assurance that those efforts will not undermine the AU Vision of creating one African market. According to the AU, the AfCFTA when fully operational is expected to increase African intra-regional trade from the present 10% to about 40%. 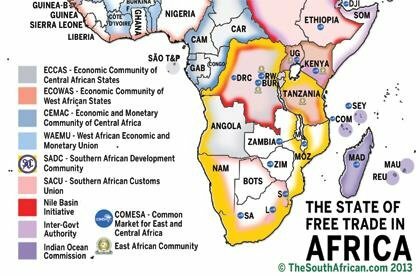 As a comparison, since the 14 member states of the Southern African Development Community (SADC) established the framework for a free trade area in 2008, intra-regional trade increased from US$89 million to US$394 million, a 341% increase in 11 years. For example, when SADC attained the status of the FTA in 2008, intra-regional trade in southern Africa increased from US$89.3 million in 2001 to US$394 million in 2012, representing a 341 percent increase over an 11-year period.